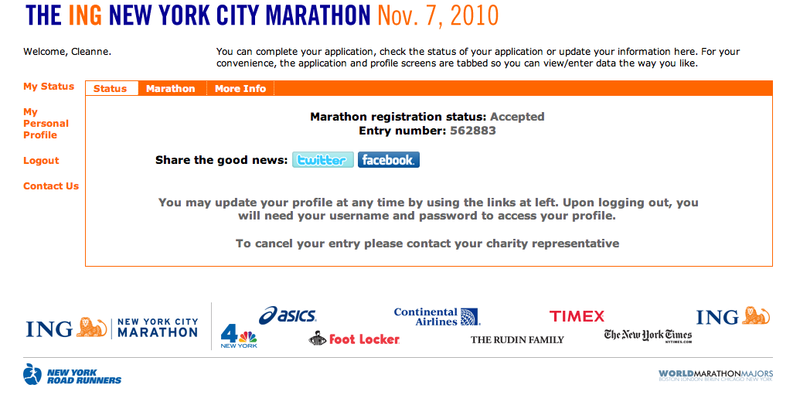 NYC Marathon -- I'm in!!!! another Rock and Roll race! I'm not sure if it was just darker out this year... or if I got up earlier, or what. But I set my alarm for 4, got up, slathered Body Glide all over, got dressed, had some breakfast, and was on the road by 4:30. Tried to park in the same lot as last year, but something had gone wrong with their timing system, so I gave up and parked in a lot one more block away. Last year Wil and I joined a line that rapidly grew... this year, I basically walked up and got on a bus... though it seemed like they had a few different pickup points, which sped things up. The shuttles also used a different route than cars would have, which meant we didn't have that same backup. So clearly they learned from last year. Grabbed some water and a banana and sat down to stay off my feet. 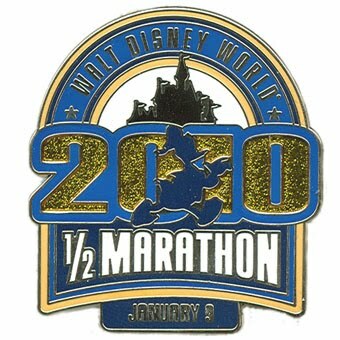 I had learned a lot from last year, too -- no need to get into the corrals until they start moving... which gives you a lot of time to use the porta potties. :) I asked the "solutions" folks which corral I should actually start in, and they recommended #23. I waited until #22 moved forward and #23 started to shift before slipping in to the corral through a gap in the barrier. Perfect! A little fiddling with electronics, some nervous banter with strangers, and we were off. I actually think there may have been more music along the course this year -- and only one of the stages was quiet when I ran by. I loved "Matt", the giant Brooks arch at mile 1 (though, as I have said a million times, I'd rather have an additional water stop between miles 10 and 12 than a stop at mile 1! ), the totally rocking band playing at mile 3, the gang dressed as various rock legends (including a "Like a Virgin"-era Madonna in white), the very chipper cheerleaders, and the stretch along the lake -- oh, especially the rockin family, who again were out on the course making music. A little kid pounding on two drums? THAT'S rock and roll. I had carried powerade with me this year so I wouldn't get so thirsty at the end of the race, and I think that really helped. I also really figured out my 'fuel' needs -- never felt too low on energy until the very end. I even was prepared to go through my usual mile 12 "Man, I am so DONE" rant. What helped, of course, was that sweet Wil came out to cheer me on. :) See, ever since we started racing, I have wanted to see a sign with my name on it... with bonus points if someone clanged a cowbell as well. So Wil made my dream come true by 1. holding a sign, 2. clanging a cowbell. (Yes, he ordered it online from cowbell.com. Honest.) I saw him at about mile 11.5, so I pretty much coasted to the finish after that. 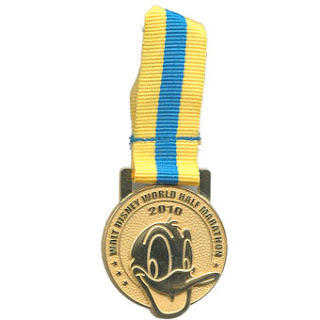 Half marathon #8! Other random thoughts: ran with a female Elvis (Elvette?) for a mile or so, and it was like running with... well, like running with Elvis. The fans went wild. Apparently someone ran in a full polar bear suit to raise awareness of their dwindling habitat. 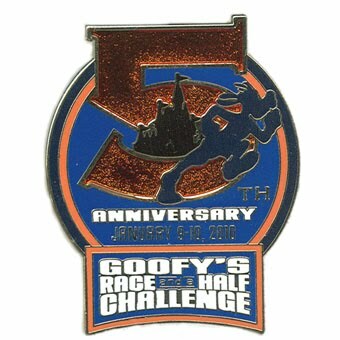 Wil said he saw him running... and post-race with his "head" off. The tunnel is still my least favorite part of the course. Competitor have a great thing going -- I saw loads of people racing in the tech shirts from other Rock and Roll races. Lindsay and I both got caught up in the moment at expo and registered for 2011. Guess that's one race on the books! For archival purposes, here's a link to the course map. We went in and got our packets first. Strangely, there was no line for "Corral 1". Snort. Lindsay's corral had a very thorough lady... who was explaining the contents in great great detail. Strange omission -- no "chip check" spot. Seem like everyone has those nowadays. Then we picked up our shirts -- green this year... bright bright green, and the shirts were the same for both the full and the half. Then goody bags, again the heavy plastic like last year. Congratulations Runner. 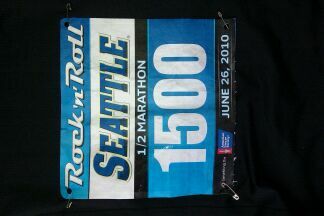 You are in Seattle WA., just hours before your grueling full or half Rock 'n' Roll Marathon. It's too late to admit that running a marathon may have been a bad idea. 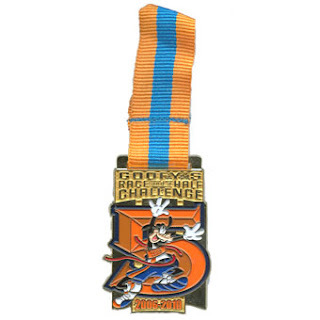 Embrace it and remember, when your legs shudder, your chest heaves and your bowels quiver, the Brooks Miles is just ahead. There you'll find refreshments, hearty support and a new lease on life. Only a dozen or so miles to go, but who's counting? 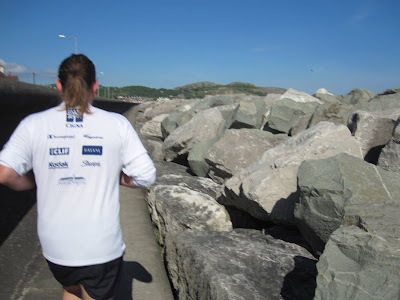 Run Happy, Runner. Destiny awaits you! We left the merch area and wandered the expo for a while. We glimpsed the adorable Meb Keflezighi signing autographs in the Sony booth, but didn't want to wait in the line. We also had a quick wander through Nutrilife's exhibit... which probably was a decent expression of the brand, but didn't feel very engaging. We decided against actually doing the "test" and just headed out. I've laid out all my clothes, am charging my phone and my iPod, and feel pretty prepped for tomorrow. 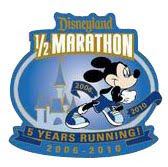 Sure, I haven't run much in the past several weeks... two short runs in England but other than that I haven't run since the Kirkland half back in May. Oh well... maybe I'll have fresh legs? These past two weeks have been rough -- l am looking forward to having some quiet (but active) mental space in which to release some of this ... anger? Stress? Frustration? I worry a bit that I will have a difficult time keeping my own pace -- I'm not so good at that. But tomorrow's goal is just to finish and to have fun. Yeah, they weren't kidding. Still, kinda fantastic to have such a great number! This is also possibly the largest race bib ever. Easy enough for the fellas, but just where exactly am I gonna put this? Now that I don't have to be on the east side by 7:30 I have more flexibility in my morning routine... so I decided to try the "Serious Sculpt" class at my gym in Ballard. Never having been to a group class there, I didn't know what to expect. Did I have to get there 15 minutes early to put my name on a list? Nope. In fact, at 5:50 there was no real indication that there would even be a class that morning. But at 5:58 there was a small flurry of activity as about 12 of us got step benches, risers, hand weights, and (gulp) jump ropes. I don't know the last time I jumped rope. I doubt it was in the current millennium. I'm a big fan of group exercise -- at least in a semi-anonymous way. I like the shared energy... and I like someone else telling me what to do next. Overall a fun and challenging morning. Disney is great at pulling money out of wallets. It's one of their great gifts that they usually do it in a way that you don't mind. :) For every race they release a commemorative pin. 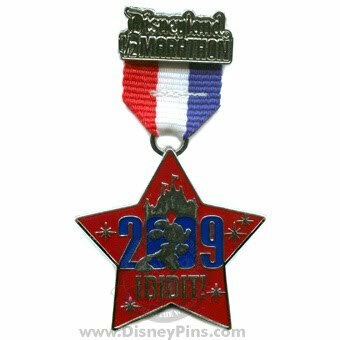 I suppose it helps that they already made hundreds of different designs as part of their "Pin Trading" program, which means that they already have the production and distribution in place, AND if they find themselves with extras after the expo they have a non-running market that will buy them as limited editions. When you register for a Disney race, they allow you to purchase up to two pins per registration, so Wil and I always get a pair of each one that's available. The catch is, in most cases you don't know what the pin looks like when you sign up! Luckily, we have liked all of them so far. 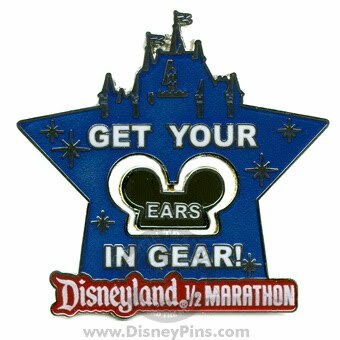 When we registered for the Disneyland Half Marathon, there were two pins available, so of course we got both. 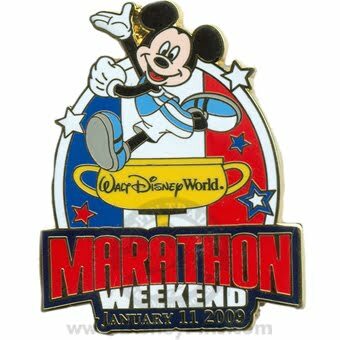 For the 2010 Walt Disney World Marathon weekend, we bought the pins for both races plus the Goofy Challenge. 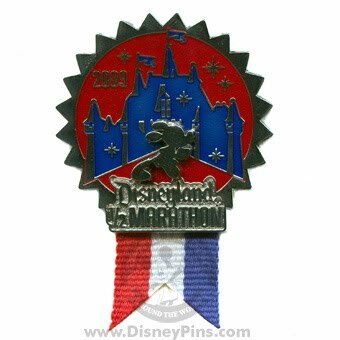 This may well be our last Disney race -- Anaheim isn't the most inspiring place to run, and Florida is really far to go. 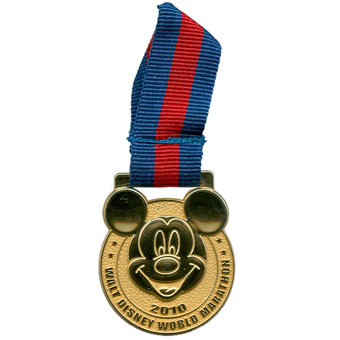 But it's nice to be wrapping up on an anniversary year with special medals, shirts, and, yes, pins. I keep getting these nagging feelings like there's something I have to do this weekend... and then fret for a moment that this weekend is the half... and then remember it's next week. Last night Lindsay asked if we could go to expo together, which reminded me that I needed to print out my packet pickup info. (There's not much else for me to be doing at the office...) Printed it out, thought "Ooh, 1500, that's a cool number" and then read my corral placement. Corral 1? Huh? 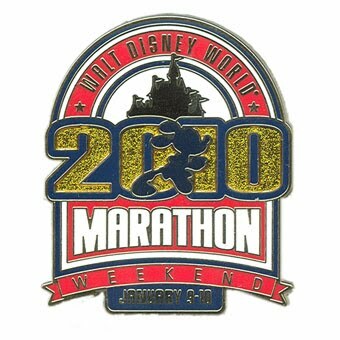 Projected finish time 1:30? What? 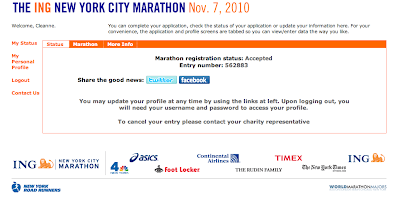 Let's just say I'll be gracefully dropping back a few (or a dozen) corrals. Arrived back in the office on Monday morning at 7:30 to discover that there had been a re-org while I was away, and that three of my close friends were let go. At 8:00, I discovered that I, too, had been re-orged out of a job. It was the best of times, it was the worst of times. Why this is bad news: no one likes looking for a job. Mortgages like to be paid. I'll miss my TMo pals. Why this is good news: I had been ready to leave for a few months, but couldn't make the leap on my own. I'm excited at the prospect of finding something new. I will be able to FINALLY arrange to have that treadmill moved into my basement! Oh, and it's the early days of the 2010 World Cup. In other news -- we had a great time in Paris, even if I haven't yet blogged about it. My only little regrets are that we didn't do a couple of things.... about which it occurred to me afterwards that they would be a fantastic Paris triathlon! 1. A swim in the Josephine Baker pool on the Seine. 2. A bike ride in a "velib" bike. 3. A run along the Seine. 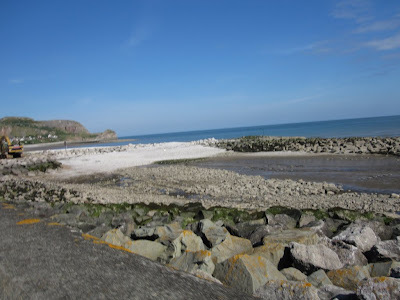 Our running route: the road along the seafront in Penrhyn Bay. My favorite running buddy zipping ahead of me (as usual!). 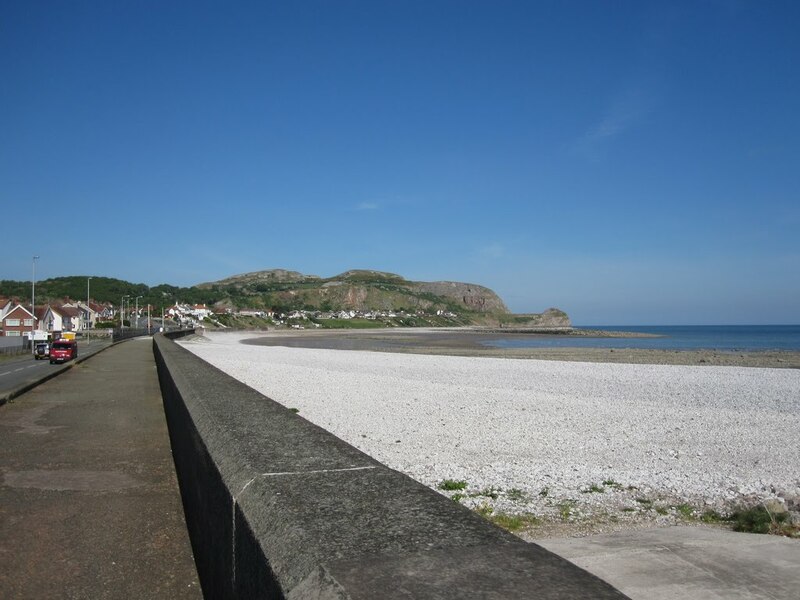 Looking along the beach to the Little Orme. On our last day in England we got up and ran around the parks near Beck and Steve's place in West Bromwich. 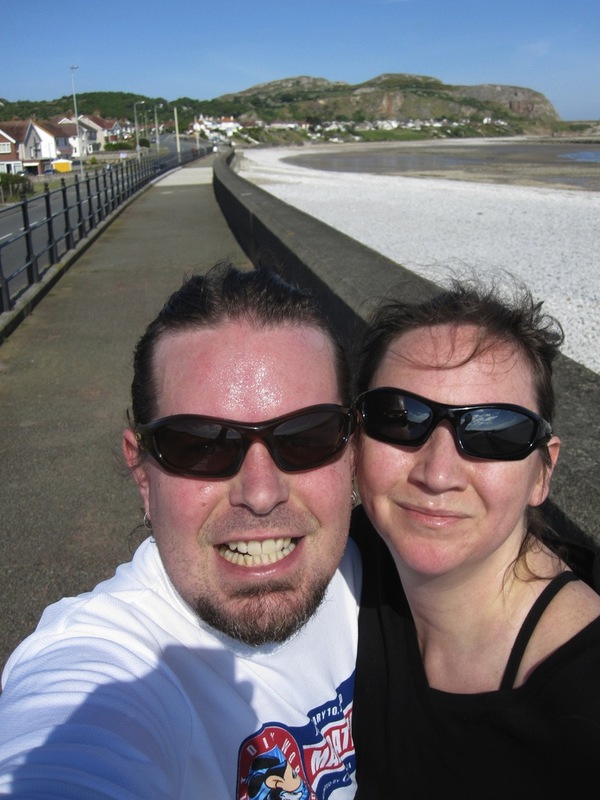 We started by running down to Sot's Hole, which is a really leafy little nature reserve. Running down the hill through the reserve, we skirted the edge of a golf course and ran into Sandwell Valley reserve -- a huge expanse of fields and hedges. This bit was difficult to run on - tufty grass in clumps about the size of tennis balls -- perfect for some potential ankle turning. Eventually we crossed a very noisy motorway (the M5) and arrived at Swan Lake. (Swan Pond?). Not very big, it still serves as a swimming hole and training spot for triathletes (bless). We circled the lake, and then started to head back to Beck's house on a different, even leafier route. 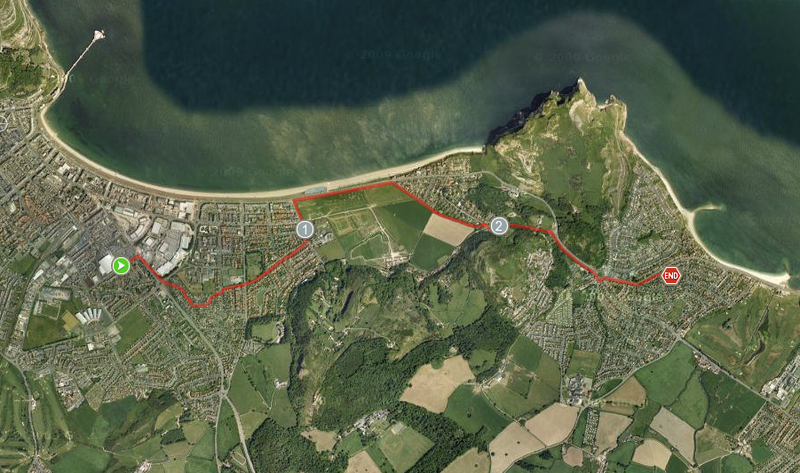 Not a huge run, again, but nice to stretch our legs and see a bit of what felt suspiciously like countryside -- even in the industrial Midlands. Lovely walk along the cycle path from Llandudno to Penrhyn Bay. 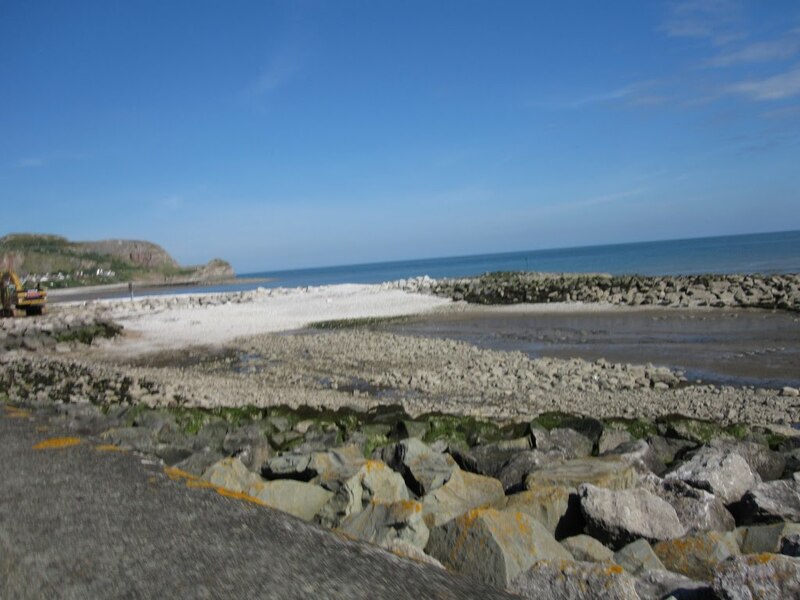 Read more on our Travel Blog!